Apple has released a new commercial, presenting the iPad Pro with iOS 11 as “a new way to take notes”. 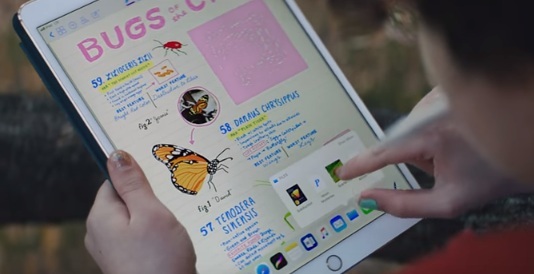 Titled “Take Notes”, the 15-second spot features the same young girl from the “What’s a computer” ad, sitting in a tree with her iPad Pro and using the Apple Pencil to create a multimedia notes, which also includes a photo that she drags from her Files and drops it into the note about bugs. The song playing in the background is “Go” by Chicago-based electronic pop production duo Louis the Child (consisting of Robert “Robby” David Hauldren and Frederic “Freddy” Judson Kennett), from their 2017 “Love Is Alive – EP”, available for purchase for $5.99. The Apple Pencil for iPad Pro ($99), described as “the best tool to reach for when you need pixel‑perfect precision”, can be used to do a variety of things, from writing down notes, to drafting a schematic, painting a watercolor to signing a lease or marking up an email, a photo, a PDF or a web page. Users can also add handwriting and drawings alongside text and search handwritten notes using Spotlight. In addition to that, they can download from the App Store other note-taking apps that enables them to do even more. The iPad Pro is now available with a new 10.5‑inch display, which is – according to the brand – “brighter and less reflective” and also “far more responsive” thanks to the ProMotion technology. The iPad Pro with this redesigned display is available for purchase from $649. The 12.9-inch display iPad Pro is available from $799.